Universal Pictures has released the first Legend trailer. The gangster drama stars Tom Hardy, Emily Browning and Taron Egerton. 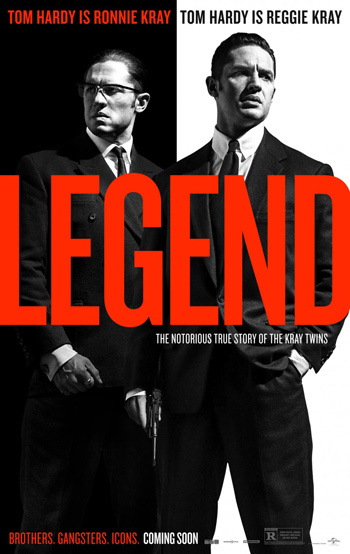 In ‘Legend’, identical twin gangsters Ronald and Reginald Kray terrorize London during the 1950s and 1960s. Watch the movie trailer below. MPAA Rating: R for strong violence, language throughout, some sexual and drug material. From Academy Award winner Brian Helgeland (L.A. Confidential, Mystic River) comes the true story of the rise and fall of London’s most notorious gangsters, Reggie and Ron Kray, both portrayed by Tom Hardy in an amazing double performance. Legend is a classic crime thriller taking us into the secret history of the 1960s and the extraordinary events that secured the infamy of the Kray twins. Written and directed by Helgeland, the Studiocanal, Working Title and Cross Creek film co-stars Emily Browning, David Thewlis, Christopher Eccleston, Chazz Palminteri, Tara Fitzgerald and Taron Egerton. Working Title Film’s Tim Bevan and Eric Fellner produce Legend alongside Chris Clark, Quentin Curtis and Cross Creek Pictures’ Brian Oliver. Universal will release the thriller in the U.S., and Studiocanal will distribute in the U.K., France, Germany, and Australia/New Zealand.